Oh Amy, isn't Alethea growing up fast! Lovely outfits. I really fell for your jacket and skirt look, and the jumper with the white jeans. And Coco pearls!! And yes, I so like seeing how you've worn things previously. Just one reason why your blog feels like IRL. Have a nice weekend, hugs, x.
I know, it's so sad! Yes, I loved the way the jacket looked with the skirt. It was so funny, because I normally never would have tried that look until my daughter said "business casual" attire. Thanks so much Marci! I love my family so much! We are so fortunate to have each other. I have two corduroy jackets similar cut to this one and love them! Such great outfits, I especially love the jacket paired with the skirt. Alethea is such a cutie! I love her dress! Thanks Elli! I should have bought more in different colors at that price. Maybe I will! I like it best with the skirt too, which is so funny as it was a outfit put together at the last minute. I planned on wearing a different dress but the weather cooled off too much. What a cool jacket! I love that shade of grey. Congrats on her dedication. Such a special day. Love the jacket and I totally agree with you about grey boots adding more interest than black. Thank you! I find I wear these grey booties more than any other color too! Hi Amy, You've got a grey eye for styling - black and grey looks really good together. I love corduroy, and enjoy making skirts out of it for winter. 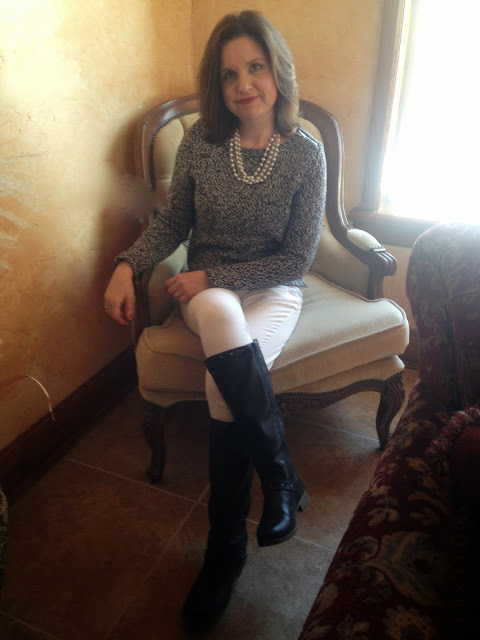 My favourite look from your outfits might just be your sweater with white jeans and long boots - it's really chic, especially with the pearls. Thank you! I find I always tend to be drawn to grey when shopping too and I must remind myself that I have enough grey in my closet already! And that black and white outfit is cute, I need to wear that look again! It looks like Alethea is past her colic and a happy little girl now, it is always nice when they are good during a long service! :) She is just a little doll!! I REALLY love that jacket and in the first outfit it looks like the color matches your boots. I need some gray boots instead of just my black/brown pairs! Thanks Carrie, yes, Alethea is past her colic and a very happy baby now; although she still doesn't sleep very well. Yes, the color of the jacket is the same as the boots. And you definitely should get a pair of grey boots...you won't regret it! great outfit and love those black boots paired with beige /off white pants. oh! and your grand daughter is such a beautiful baby gir?. Thanks so much! I really do need to wear that outfit again as everyone seemed to like it. Oh your granddaughter is adorable! I like these outfits too, your corduroy jacket is lovely. I had one when I was in school, wore it so much that I actually wore it to pieces, it got threadbare! Was so sad when I couldn't wear it any more! Thanks Mica, I have a feeling this jacket will be worn thin too! What a gorgeous jacket, Amy!! And it's so wonderful to see the photos of your granddaughter!! Thanks Jodie! Have a Happy Thanksgiving! Awwww your granddaughter is an absolute angel! Lovely to see her here. 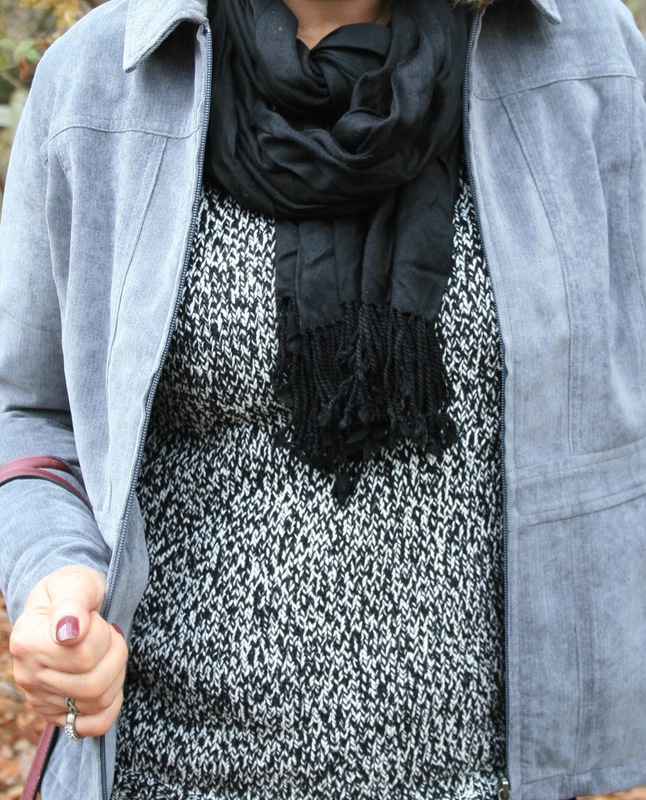 Thank you for linking up your jacket outfit to #fakeituntilyoumakeit! WELL YOUR NEW GRANDBABY STEALS THE POST HERE. But nevertheless I love your first outfit especially. That blueish-gray jacket is pretty and classy and it matches those cute boots so well. I have grey boots on my post today, also. haha! Yes, I agree with that! Alethea did steal the show! Aww, thanks Nicole! I can't believe I'm a granny either. I hope you had a Happy Thanksgiving too! That sounds like a very successful shoppin spree! I love your grey jacket. Alethea is such a cutie! Thanks for linking up!